The STUDENT WORK SAMPLES link contains Writing & Media Workshop Winter 2017 8th Grade videos. These videos are comprise of FINAL EXAMS submitted by six Reid Middle Schoolers from 8th grade class of 2017. Every year Reid Middle School eighth graders spend a semester in Writing & Media Workshop learning about broadcast journalism. It’s an exciting curriculum that teaches students how to be reporters. Students start out by doing research using approved middle school friendly news sources such as: Newsela, DoGoNews, Earth Sky News, New York Times Education, National Geographic, NASA.gov, and more. They then select topics that are important to them, their community, and the world. Next, they perform research and are taught to save and edit their work in Google Docs. To work on reading comprehension skills, students enter a Close Reading process to ensure they understand all our vocabulary words, learn details from their research, and paraphrase information learned. The next step is to write a news story following formats provided by Public Broadcasting System for Kids. Once the news stories are written, students learn to report in front of a camera, and how to serve on a camera crew. 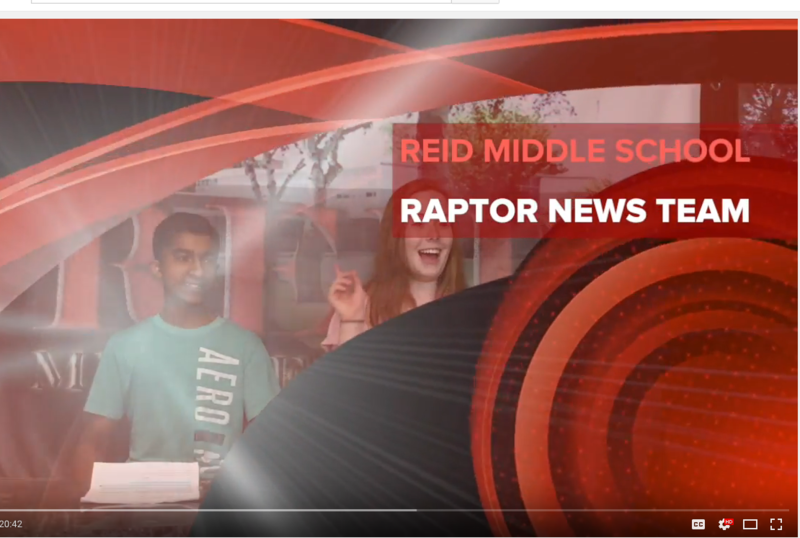 Finally, they buckle down to edit their videos with the help of Ms. Sirker, Reid’s Writing & Media Specialist and Raptor News Team members, who are more experienced with making videos. Congratulations to Ben Vengalil, Kileigh McGann, Paige Mickle, Ian McGrath, Gavyn Carter, Leeah Choon, Taylee Alfonso-Came, Crystal Moore, Jakayla Sims, and Nina Snowise on their excellent work! To view these work samples go to the menu at the top of this page. Click on Welcome to Writing & Media Workshop, then click on Student Work Samples. Enjoy!